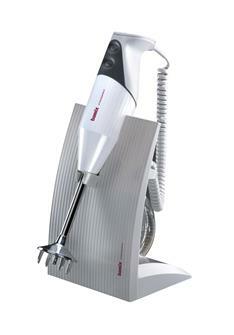 Bamix hand mixers manufactured in Switzerland for over 30 years. 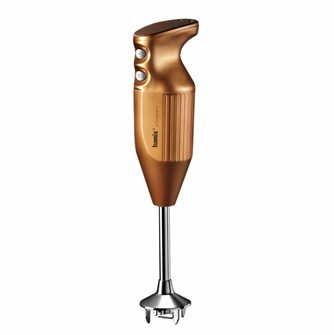 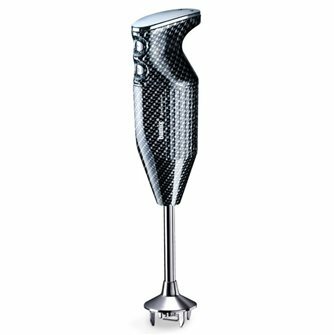 Silver Bamix 160 W hand blender. Comes with a stand that can also hang on the wall, a star-shaped blade, whisking attachment, mincing blade, mixing attachment and mill for grinding. 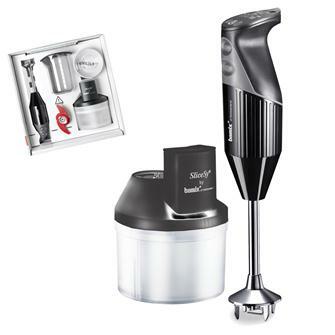 Black Bamix hand blender with black SliceSy mixer. 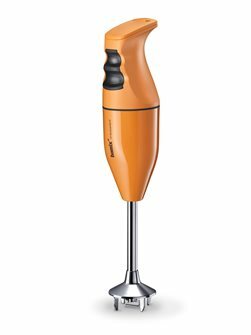 Bamix 140W hand held blender with white wall hanging, star-shaped knife, whisking disc, mincing knife, mixing disc and 600 ml beaker. 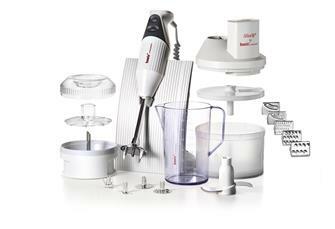 Bamix Swissline 200 W hand blender in red with a stand, a 200 ml processor, 900 ml beaker, star-shaped knife, whisking attachment, mincing knife and mixing attachment. 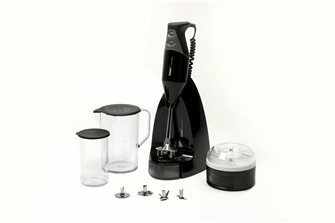 Bamix Swissline 200 W grey hand blend with a black stand, a 200 ml processor, 1 litre jug, star-shaped knife, whisking attachment, mincing knife and mixing attachment. 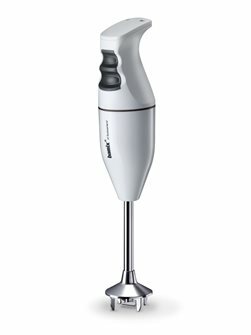 Bamix white hand blender with white SliceSy chopping bowl. 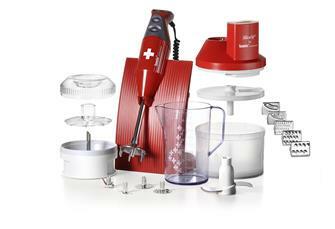 Bamix red hand blender with red SliceSy chopping bowl. 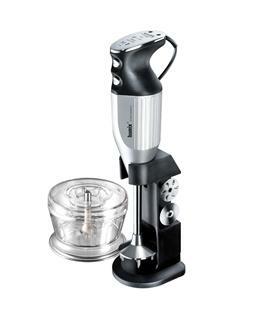 Bamix silver hand blender with silver SliceSy chopping bowl. Bamix hand blender 140W with red wall stand, star-shaped knife, whisking attachment, mincing knife, mixing attachment and 600 ml bowl. 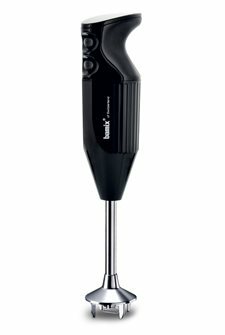 Bamix hand blender 140W - black - with wall or table stand, star-shaped knife, whisking attachment, mincing knife, mixing attachment and mill for grinding. 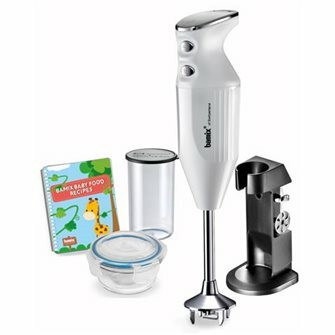 White Bamix Swissline hand blender 200 W with white stand, 200 ml processor, 1 litre jug, star-shaped knife, whisking attachment, chopping knife and mixing attachment. 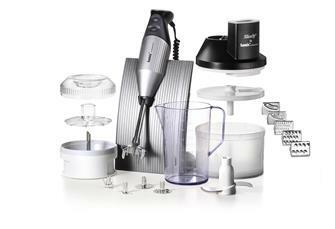 White Bamix Swissline hand blender 200 W with black stand, 200 ml processor, 1 litre jug, star-shaped knife, whisking attachment, chopping knife and mixing attachment. 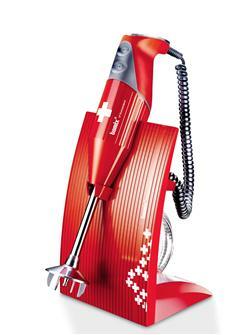 Bamix 120 W hand mixer with a star-shaped knife - red Pop model, the cutest in the Bamix range. 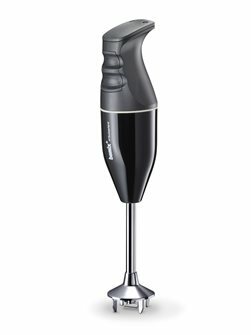 White Bamix Swissline hand blender 250 W with black stand, 200 ml processor, 1 litre jug, star-shaped knife, whisking attachment, chopping knife and mixing attachment. 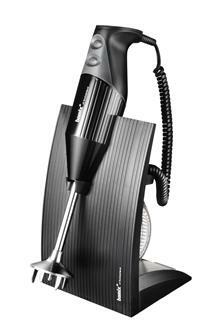 Bamix 160W DeLuxe Carbon Diver Mixer. 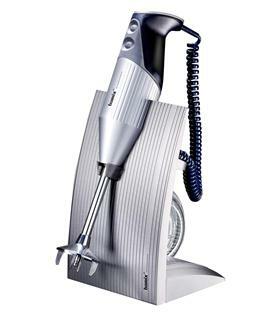 Delivered with stand or wall mount, star knife, whisk disk, chopping knife mixer disc and grinder for grinding. 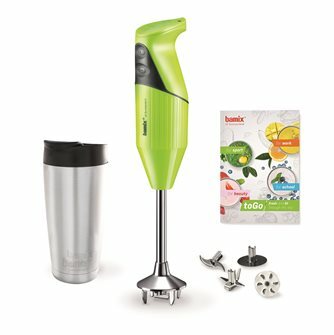 Bamix 200W black plunger mixer for barbecue with recipe book, cups and apron. 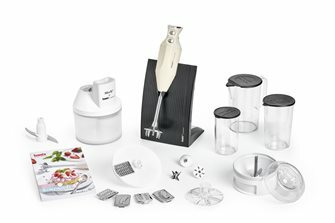 Very complete Bamix pastry box including a Bamix plunger 200 W 18,000 rpm white and pearlescent, 4 tips, processor, powder disc, 3 cups, SliceSy robot, stand and a booklet of 30 recipes with tips and tricks.